I came to this country way back 2000 and I was the only one of the expat pioneers left in the Royal Orthopaedic Hospital. The original ROH expats were Danis and Teeny Onglatco, Rita Jane dela Cruz, Noli Frias and Sylvia Villanueva. We organized a reunion for the 1st, 2nd and 3rd batch expats and that includes the one working in Kuwait and UAE. It was being held in Mayette's residence here in Northfield last 23rd of August. Sylvia, Danis, Teeny and kids and Rita Jane came over. I came late on that day because I was not feeling well when I came back from London. Present were Zaldy, Cecille, Jessie and family and Hams and family and Eva. 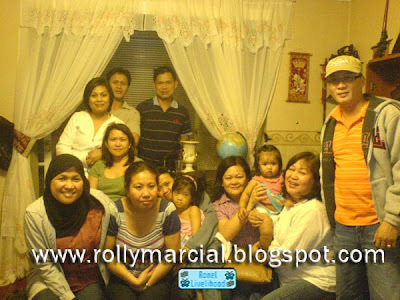 Madel, Mabel, Alice, Noli, Steve and Connie were not able to make it. I just hope that there will be more like this in the future. Please click here for more events. diri, ambot lang kaha, kay di man ko kaayo moapil basta dli nako gyd kaila..
puro bc mga tawo diri sa? At last kasulod na jud ko..Dli ko ka comment sa imo other blog..Anyways,Thanks for the visit..God Bless! !